A delicious rustic tart made with a flaky crust and filled with fresh plums. Made with coconut oil instead of shortening, this tart is not only a little healthier, it's also vegan-friendly! You can use your hands or a food processor. In a bowl or a food processor, combine flour and salt. Cut in with a fork/pastry blender or pulse in butter and coconut oil/shortening until mixture becomes coarse and crumbly. Add liquid a tablespoon at a time and mix in after each addition of liquid. Stop when dough comes together and is moist. You may not need the full amount of liquid, I only used 3 tablespoons. Shape into 1 large flat, round disc and cover with plastic wrap. Refrigerate for 10-15 minutes, at least, until butter and oil have chilled again. This makes it easier to roll out. When you’re ready to make the tart, preheat oven to 375 F. Take the dough out of the refrigerator and set on parchment paper. Place another piece of parchment paper on top. Roll dough into a ¼ inch thick circle. 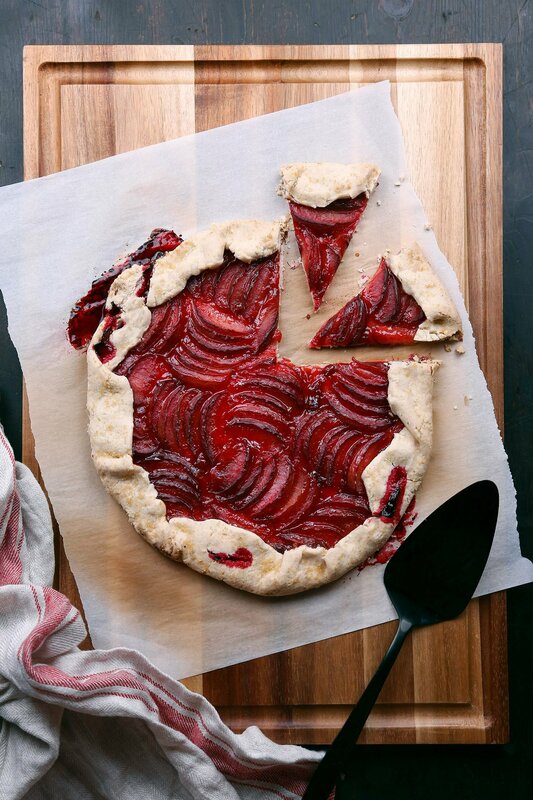 Stick the dough back into the fridge to chill for a few minutes while you slice the plums.To make it easier, you can go ahead and place the dough onto a cookie sheet before you assemble the tart. That way you don't have to transfer it after it's prepared and possibly mess it up. Leaving a 2” border around the edge of dough, brush the middle of the dough round with 1-2 tablespoons of preserves. Continue to leave a 2” border and place plum slices in any pattern you'd like over the preserves. Sprinkle the plums with the coconut sugar and place small pats of coconut oil or butter on top. The dough is fragile, so use the parchment paper to lift the dough edges up and over the plums, pleating the crust. Lightly brush dough with melted butter and sprinkle on sugar. Bake the pan in the preheated oven for 45-50 minutes or until crust is golden brown, time may vary depending on your oven. Use your favorite store-bought pie crust in a pinch. You can also use peaches or nectarines instead of the plums. Berries work well too!